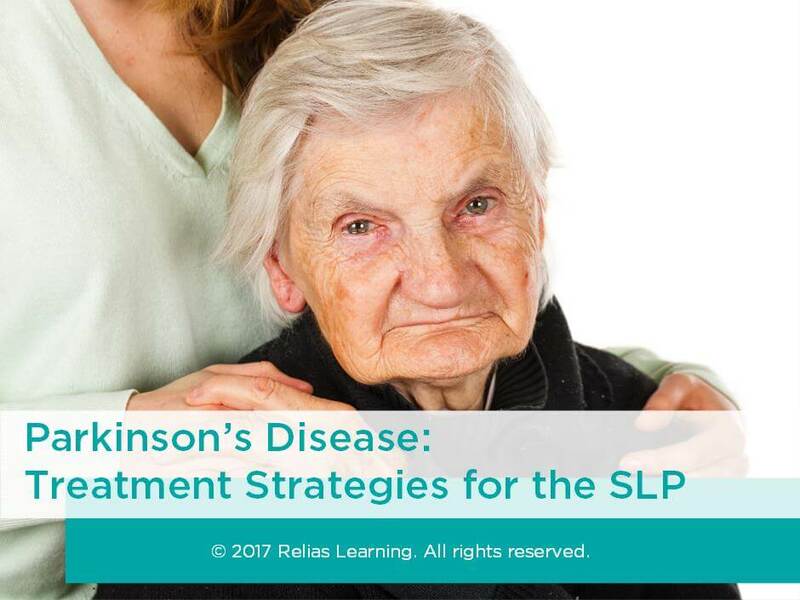 During this course, you will learn about Parkinson’s disease (PD), including pathophysiology and review of characteristics of PD that impact a person’s speech, swallowing, and cognition. You will examine the role of speech language pathologist for assessment and management of related deficits as well as rehabilitation considerations, specific evaluation and assessment, and intervention and management techniques. Identify 3 common characteristics of Parkinson’s disease. Identify 3 areas assessed by a speech language pathologist (SLP) during a comprehensive evaluation. Explain the impact Parkinson’s disease may have on a person’s speech, swallowing, and cognition. Describe 3 evaluation and treatment options for speech, swallowing, and cognition. Jean Marie Lucarelli is a licensed New Jersey Speech-Language Pathologist and holds an ASHA Certificate of Clinical Competency. She received her Bachelor of Arts degree in Communication Disorders from West Chester University and a Master's of Science degree in Speech Language Pathology from Marywood University where she was a member of the Alpha Epsilon Lambda Honor Society. Jean Marie has experience in providing speech and language services for clients with a wide range of diagnoses including Traumatic Brain Injuries, Cerebral Vascular Accidents (Strokes), Head and Neck Cancers , Cognitive Disorders including Dementia, and Neurological Degenerative Diseases, (e.g. Parkinson's Disease and Multiple Sclerosis). She also has extensive experience in the diagnosis and treatment of dysphagia and swallowing difficulties. Disclosure: Jean Marie Lucarelli, MS, CC_SLP has declared that no conflict of interest, Relevant Financial Relationship or Relevant Non-Financial Relationship exists. The target audience for this course is: intermediate level Speech and Language Pathologists; in the following settings: All Healthcare Settings, Rehabilitation Settings.